AB Dynamics has released v8.9 of its Robot Controller software for the track testing product range with a stronger focus on safety and reliability. This version will mean that Synchro communications can now be done in a PowerPMAC controller which will give much higher reliability of vehicle to vehicle communications as it is run on a real-time OS instead of the non-real time OS Windows. It will also enable the user to write their own python scripts that can run in real time on a PowerPMAC controller, allowing them to calculate simple or complex channels, create their own triggers and even modify the path that they are following in real-time. Obstacles can be identified and boundaries tracked by using colour to mark up an image map. An unlimited number of obstacles can be marked in detail on a pixel-by-pixel basis. This can be used for real time collision detection and is only available for PowerPMAC. A feedback channel can be set up for the steering system position of hydrostatically steered vehicles, using a suitable transducer. This allows for automatic re-zeroing of the steering robot (SR) before open loop tests and enforcing SR position limits. This is a PowerPMAC only feature. Limits can be set for the SR angle, SR velocity and lateral acceleration that are used only during the lead-in to a path following test. This allows for different limits to be used for the lead-in when on the test path. For the Euro NCAP AEB car-to-car 2018 group, the distance correction for the CCRb (car-to-car rear braking) scenario is now completed in the GST / GVT by default. 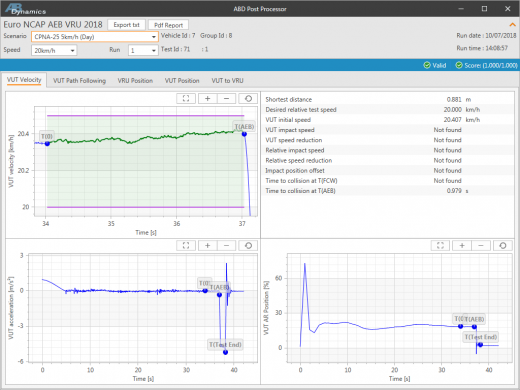 A Beta release of the new ‘RC Post Processor’ application allows the user to see the results of post processing the Euro NCAP AEB VRU 2018 group. A public release of this application will be coming soon. The PMAC releases that can be associated with this release are TurboPMAC v8.5.5 and PowerPMAC v8.9.2. These versions will be sent out with all new systems and are available for all supported systems.